The basement of many Cambridge area homes is neglected, left undecorated and kept unlivable. If you are one of these people that has held off working on your basement, I suggest you think again. Consider the incredible potential that lies just below the main floor of your home. Think not only about the square footage that making your basement functional would add to your family’s space, but think too about all of the great ways you could put that space to use. 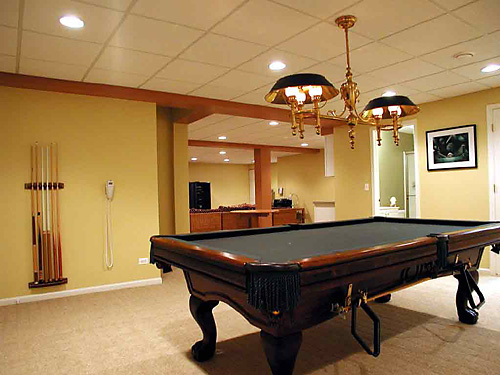 At Pann Home Services, we believe your basement should be an extension of your home! In fact, it is an additional floor of your home, which should be used for living space. Those that have had their basements finished by our professional Cambridge remodeling contractors agree that finishing your basement is a valuable investment. The space you create can be used for many things. Some of the most popular would be: a space for your children to play, entertaining business associates, family and friends, or just a place for you to unwind from your long day. We believe that a well-designed basement should accommodate all of the above! You can be confident that your basement remodel is being completed by experts in their particular field which enables our contractors to know the codes expected, in addition to having less problems now and in the future. Someone from our company is there at all times keeping an eye out on the work being completed by the professionals. Additionally, communication is streamlined with all team members on the job. If you are looking for Cambridge Basement Remodeling then please call 800.286.5959 or complete our online request form.